Dr. Brent Fulton, Assistant Adjunct Professor and Research Economist, and Dr. Sue Kim, Research Scientist, both from the Nicholas C. Petris Center on Health Care Markets and Consumer Welfare, School of Public Health, University of California-Berkeley, conducted the cost savings analysis presented in this report. As they work to reduce health care costs and extend the solvency of programs like Medicare, policymakers will confront tough choices in the months and years ahead. Yet, they must also be alert for reforms that cut costs while maintaining quality services for beneficiaries. This analysis by Professor Brent Fulton and Dr. Sue Kim of the University of California at Berkeley explores one possible way for policymakers to generate substantial Medicare savings without reducing services or quality of care. This study examines ambulatory surgery centers (ASCs). ASCs are technologically advanced medical facilities that provide same-day surgical procedures, including important diagnostic and preventive services like colonoscopies. Today, more than 5,300 Medicare-certified ASCs serve communities throughout our nation. These ASCs perform many of the same procedures as hospital outpatient departments (HOPDs). ASCs, however, are able to provide care much more efficiently and without the often costly overhead associated with hospitals. According to an industry calculation, the Medicare program currently reimburses ASCs at 58 percent of the HOPD rate, meaning that Medicare—and the taxpayers who fund it—realize savings every time a procedure is performed in an ASC instead of an HOPD. $6 billion of these savings were realized by the federal Medicare program. The remaining $1.5 billion went directly to Medicare beneficiaries. In other words, Medicare patients nationwide saved $1.5 billion thanks to the less expensive care offered at ASCs. ASCs have the potential to save the Medicare program and its beneficiaries up to $57.6 billion more over the next decade. Beneficiaries themselves also stand to save considerably in future years. 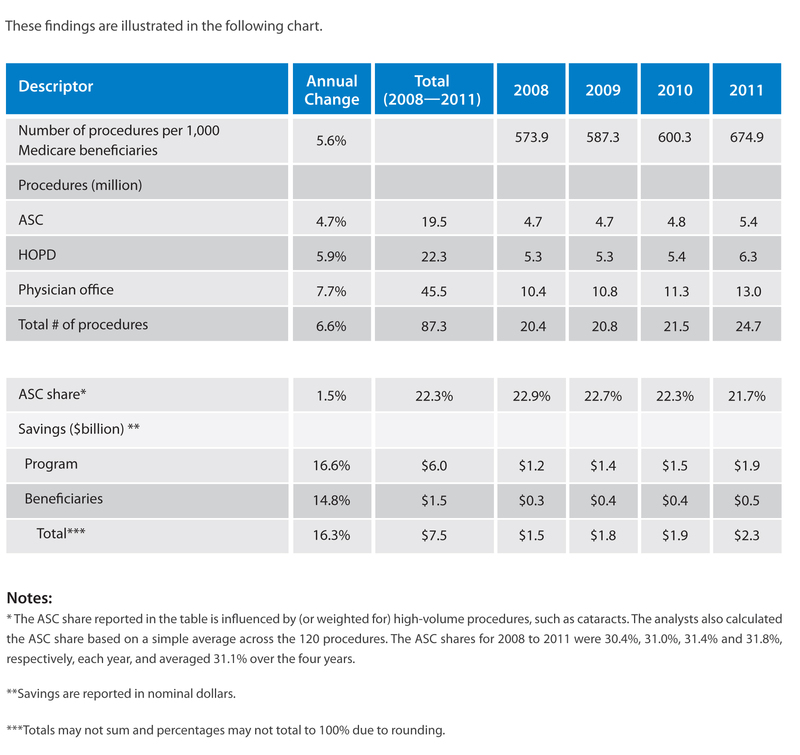 Because Medicare reimburses ASCs at a lower rate than HOPDs, patients also pay a smaller coinsurance amount in an ASC. The authors use the example of cataract surgery, noting that a Medicare beneficiary will save $148 on his or her coinsurance by electing to undergo surgery in an ASC instead of a hospital. These findings have important implications for policymakers’ ongoing discussion about how to most effectively reduce health care costs and the national budget deficit. The clearest implication is that, while public officials may indeed confront tough choices in the years ahead, the choice to encourage ASC use within the Medicare program is an easy decision. These findings suggest that ASCs offer a “win–win” for patients and the Medicare system, since they provide substantial savings without any corresponding reduction in quality or benefits. While the future savings offered by ASCs are easily attainable, however, they are not inevitable. Indeed, a discrepancy in Medicare reimbursement policy could jeopardize the savings ASCs provide. Medicare uses two different factors to update ASC and HOPD payments—despite the fact that the two settings provide the same surgical services. ASC payments are updated based on the consumer price index for all urban consumers (CPI-U), which measures changes in the costs of all consumer goods; HOPD rates, meanwhile, are updated on the hospital market basket, which specifically measures changes in the costs of providing health care, and so, more accurately reflects the increased costs that outpatient facilities face. Since consumer prices have inflated more slowly than medical costs, the gap in ASC and HOPD reimbursement rates has widened over time. If the reimbursement rate for ASCs continues to fall relative to their HOPD counterparts, ASC owners and physicians will face increasing pressure to leave the Medicare system and allow their facilities to be acquired by nearby hospitals. When an ASC is acquired by a hospital, the Medicare reimbursement rate jumps roughly 75 percent. This threatens to turn the cost-saving advantage of ASCs into a perverse market incentive that drives ASCs from the Medicare program. Already, the widening disparity in reimbursement has led more than 60 ASCs to terminate their participation in Medicare over the last three years. If the reimbursement gap continues to widen, more ASCs will leave the Medicare program. As a result, more Medicare cases will be driven to the HOPD, causing costs to both the Medicare program and its beneficiaries to rise. Thus, realizing the full potential savings that ASCs offer will likely require policymakers to step in and halt this continuing “slide” in ASC reimbursement rates. Because Medicare saves money virtually every time a procedure is performed in an ASC instead of an HOPD, any policies that reduce the widening reimbursement gap between ASCs and HOPDs, and that otherwise encourage the migration of cases from the hospital setting into ASCs, will increase total savings for the Medicare program and its beneficiaries. Only 40 years ago, virtually all surgeries and diagnostic procedures were performed in hospitals. Today, however, standalone facilities known as Ambulatory Surgery Centers (ASCs) provide outpatient surgical care in an atmosphere removed from the competing demands that are often encountered in an acute care hospital. ASCs, as this report details, offer patients a cost-effective alternative to hospital outpatient departments (HOPDs). The first ASC opened in 1970, and today, there are more than 5,300 Medicare-certified ASCs in the United States. The overwhelming majority of these ASCs are at least partially owned by physicians, which allows for better control over scheduling, as procedures are not often delayed or rescheduled due to staffing issues or competing demands for operating room space from emergency cases. ASCs perform more than 40 percent of all Medicare colonoscopies, contributing to a decade-long decline in colorectal cancer mortality. The ASC industry also led the development of minimally invasive procedures and the advancement of technology to replace the intraocular lens, a procedure that is now used nearly one million times each year to restore vision for Medicare patients with cataracts. Once an inpatient hospital procedure, it can now be performed safely at an ASC at a much lower cost. The more than 5,300 Medicare-certified ASCs in the United States today provide identical services to those performed at HOPDs throughout the country. ASCs are able to perform these surgeries much more efficiently than HOPDs. ASCs do not incur the often substantial administrative and overhead costs associated with a hospital. This enables ASCs to provide these services at substantially less cost to the Medicare program—and to its beneficiaries—than their hospital counterparts. 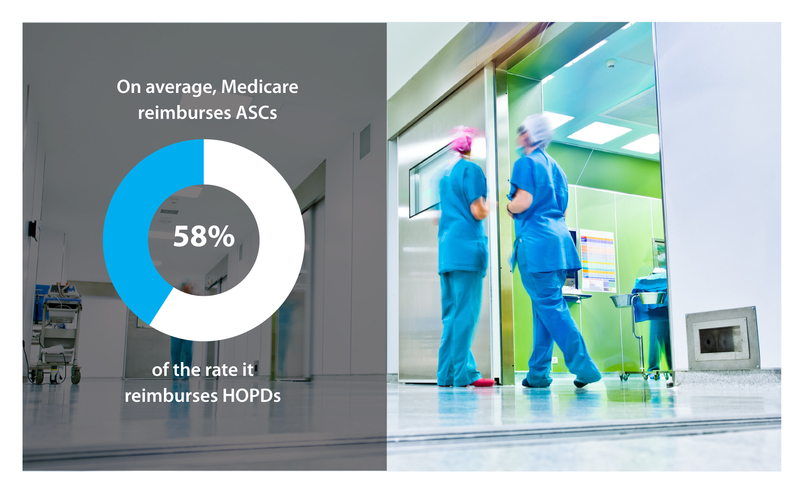 Today, Medicare reimburses ASCs at an average of 58 percent of the rate it reimburses HOPDs for the same procedures. The savings that accrue over time, even for individual procedures, are significant. For example, in 2011, Medicare beneficiaries (excluding Medicare Advantage beneficiaries) had 1,709,175 cataract surgeries, of which, 1,120,388 were performed in ASCs and the other 588,787 in HOPDs. The parallel reimbursements per surgery were $951 for an ASC and $1,691 for an HOPD, meaning that every time a patient elected to receive treatment in an ASC, the Medicare program saved $740. When applied across the 1,120,388 cataract surgeries performed in ASCs during 2011, the total savings for this single procedure reached $829 million. Professor Fulton and Dr. Kim conducted the following analysis, which looks at government data from the Centers for Medicare & Medicaid Services (CMS), to answer two fundamental questions. First, how much money did the Medicare program and its beneficiaries save from 2008 to 2011 because surgical and diagnostic procedures were performed at ASCs instead of HOPDs? Second, how much more could the Medicare program and its beneficiaries save over the next decade (2013-2022) if additional procedures move from HOPDs to the ASC setting during that timeframe? Government data was used to ascertain the volume of procedures performed in ASCs, HOPDs and physician offices from 2008 through 2011, as well as the reimbursement rates for procedures done at ASCs and HOPDs. The volume data reports are from the Medicare Physician Supplier Procedure Specific file available from CMS. It excludes Medicare Advantage enrollees. The ASC reimbursement rates are from the ASC Addendum AA1, and the HOPD reimbursement rates are from Hospital Outpatient Prospective Payment System Addendum2. 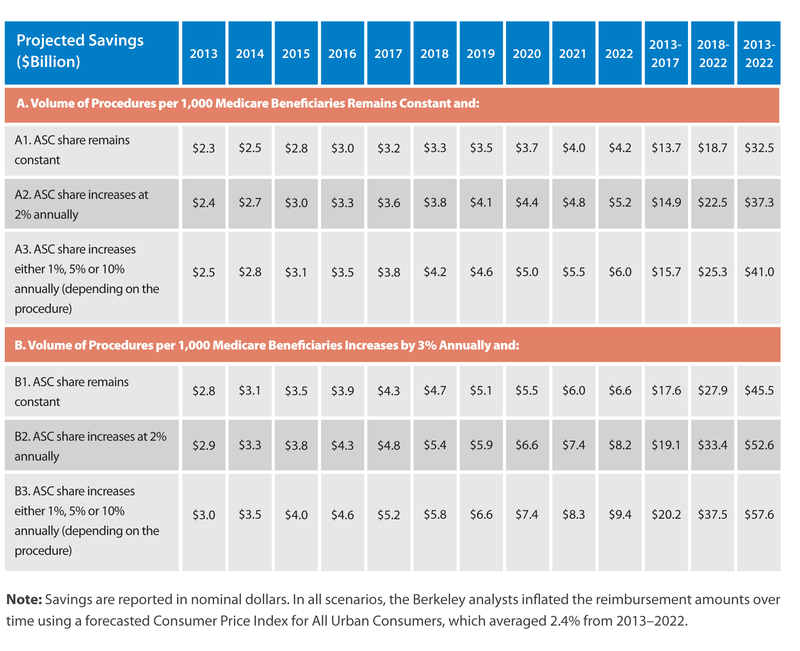 When forecasting future cost savings, the Berkeley analysts relied on CMS’ predicted number of Medicare beneficiaries from 2013 to 2022. This data set also excludes Medicare Advantage enrollees3. To ensure a realistic baseline for their analysis and predictions, the analysts limited the data set to the 120 procedures most commonly performed at ASCs in 2011, which represented 73 percent of the total volume of all procedures performed in ASCs in 20114. During the four-year period from 2008 to 2011, the lower ASC reimbursement rate generated a total of $7.5 billion in savings for the Medicare program and its beneficiaries. $6 billion of these savings were realized by the federal Medicare program. The remaining $1.5 billion was saved by Medicare beneficiaries themselves. In other words, Medicare patients nationwide saved $1.5 billion thanks to the less expensive care offered at ASCs. These savings increased each year, rising from $1.5 billion in 2008 to $2.3 billion in 2011. The increase results from the total number of procedures growing from 20.4 million to 24.7 million (or 6.6 percent annually) between 2008 and 2011 as well as the reimbursement rate gap widening between HOPDs and ASCs. These savings were realized despite the share of total Medicare procedures performed in ASCs decreasing over this period, falling from 22.9 percent in 2008 to 21.7 percent in 2011. The ASC industry is certain to continue generating savings to both the Medicare program and its beneficiaries over the next decade. The magnitude of these savings, however, will hinge on whether, and how much, the ASC share of surgeries grows within the Medicare program. That growth rate will, in turn, depend on market trends, demographic factors and how policymakers act—or decline to act—to encourage the use of ASCs within the Medicare program. To estimate the savings Medicare would realize from having more procedures performed in ASCs from 2013 to 2022, Professor Fulton and Dr. Kim applied the methodology above to six scenarios. These six scenarios, which incorporate different assumptions about both the growth of ASC share and the overall growth of Medicare procedure rates, provide a range of possible savings offered by ASCs in the next decade. The ASC share of each procedures in 2011 will remain constant between 2013 and 2022. This is a baseline assumption that assumes ASC share does not grow at all in the coming decade. The ASC share of each procedure will increase by 2 percent per year from 2013 through 2022, equivalent to the average increase across procedures from 2008 to 20116. The analysts capped the share for any given procedure at 90 percent to avoid implausible assumptions. The ASC share growth for each procedure will vary depending on that procedure’s historical share growth rate. The analysts assumed three growth rates and, again, capped the share for any single procedure at 90 percent. o	The “low” group included procedures that had negative or no growth in the share of procedures performed at ASCs during 2008-2011. The analysts assumed that the ASC share of these procedures will increase 1 percent annually from 2013-2022. This group included approximately 30 percent of the procedures. o	The “middle” group included procedures that had up to 5 percent growth in share of procedures performed at ASCs during 2008-2011. It was assumed that the ASC share of these procedures will increase 5 percent annually from 2013-2022. This group included approximately 43 percent of the procedures. o	The “high” group included procedures that had greater than 5 percent growth in share of procedures performed at ASCs during 2008-2011. This group had a median ASC share growth rate of about 11 percent annually during 2008-2011. The analysts projected that the ASC share of these procedures will increase 10 percent annually from 2013-2022. This group included approximately 27 percent of the procedures. The estimated savings are tabulated in the following table. The savings analysis and predictions for each individual procedure are tabulated in the appendix. ASCs saved the Medicare program and its beneficiaries $7.5 billion over the four-year period from 2008 to 2011. Even under the most conservative assumptions, the future savings generated by ASCs are substantial. Under the baseline scenario, which assumed that neither ASC share not Medicare procedure volume will grow over the next decade, ASCs will save the Medicare program an additional $32.5 billion during that time. As the share of procedures performed in ASCs grows within the Medicare program, so do the savings. If ASC share within the Medicare system increases even slightly, as in scenarios B2 and B3, the savings could exceed $57.6 billion over 10 years—an average savings of $5.76 billion each year. Medicare beneficiaries also save money by choosing ASCs, since a lower Medicare reimbursement rate means that patients, in turn, pay a smaller coinsurance. While the forward-looking portion of this study does not examine coinsurance rates for each procedure, it is clear that the savings realized by the Medicare program imply additional savings for beneficiaries. Using the example of cataract surgeries: a Medicare beneficiary will pay coinsurance of $338.20 for such a surgery to be performed in an HOPD, but only $190.20 for that same surgery in an ASC—a $148 savings that goes directly to the patient. Further, the above estimates are quite conservative. Even the most “optimistic” scenario assumes that ASC share growth per procedure grows only modestly more quickly than historical averages, and that Medicare volume grows at a modest, and historically consistent, rate. If policy decisions or other factors cause either growth rate to accelerate further, the savings generated by ASCs within the Medicare system would certainly exceed the $57.6 billion estimated here. A final note: although this study examined only data from the Medicare program, ASCs typically also charge private payers, including those in the Medicare Advantage program, less than their HOPD counterparts. Thus, similar cost savings also exist in the commercial health insurance market and in the Medicare Advantage program. We believe it is important to quantify these private-side savings as well and encourage others to examine this subject in future studies. An aging population, along with inflation in health care costs, means that the federal government’s expenditures through the Medicare program are projected to increase substantially in the coming years. Consequently, policymakers in Washington, DC, are exploring potential ways to reduce projected Medicare outlays and extend the program’s solvency. We believe that this study offers an important contribution to that discussion. Two specific policy concerns stand out. Our first and most important observation is that, while the future savings offered by ASCs are easily attainable, they are not inevitable. Because they provide identical services to HOPDs but do so at an average of 58 percent of the reimbursement rate that the Medicare program pays HOPDs for those services, ASCs represent a source of value to the program and the taxpayers who fund it. A discrepancy in the way Medicare reimbursement rates are updated, however, threatens to marginalize ASCs’ role within the program. CMS currently applies different measures of inflation to determine the adjustments it provides to its payment systems for ASCs and HOPDs each year. For ASCs, that measure is the CPI-U, which is tied to consumer prices. The index for HOPD reimbursements, on the other hand, remains tied to the hospital market basket, which measures inflation in actual medical costs. Since consumer prices have inflated more slowly than medical costs, the gap in ASC and HOPD reimbursement rates has widened over time. As the reimbursement rate for ASCs continues to fall relative to their HOPD counterparts, ASC owners and physicians will face increasing pressure to leave the Medicare system and allow their facilities to be acquired by nearby hospitals. When an ASC is acquired by a hospital, in what is known as “an ASC to HOPD conversion,” the Medicare reimbursement rate jumps roughly 75 percent and all savings to the Medicare program and its beneficiaries are promptly lost. The continuing reduction in reimbursement led more than 60 ASCs to terminate their participation in Medicare over the last three years. If policymakers allow this gap in reimbursements to continue widening, the cost-saving advantage that ASCs offer could morph into a perverse market incentive that drives ASCs from the Medicare program. Some in Congress have introduced legislation, which is titled the “Ambulatory Surgical Center Quality and Access Act,” that aims to fix this problem. This bill would correct the imbalance in reimbursement indices and ensure that ASC reimbursements do not continue to fall relative to their HOPD counterparts. Additionally, it would establish an ASC value-based purchasing (VBP) program designed to foster collaboration between ASCs and the government and create additional savings for the Medicare system in the process. Many of the policy options aimed at reducing Medicare costs that are being considered in Congress today involve important “trade-offs,” where reduced outlays come at the expense of retirees’ benefits. Often-discussed options such as raising the Medicare retirement age or increasing cost-sharing, for example, generate savings as a direct result of reducing the amount of benefits delivered by the Medicare program. The savings offered by ASCs, however, do not involve such trade-offs; they make it possible for the Medicare program, and its beneficiaries, to realize significant savings without any corresponding reduction in benefits. There are more than 5,300 Medicare-certified ASCs throughout the country, all of which represent an important source of efficiency for the Medicare program and the taxpayers who fund it. We recommend that policymakers explore all potential options for encouraging further growth of ASC share within the Medicare system. 4 The data set was initially narrowed to 148 procedures, which represented about 90% of the total volume. Twenty-seven procedures were dropped because of missing data on the number of procedures or reimbursement rates. One additional procedure was dropped the ASC share was 100%, and it thus provided no basis for comparison with HOPDs. 5 The number of procedures per 1,000 Medicare beneficiaries significantly increased between 2010 and 2011 (see Table above). For the lower-savings estimates (subset A), the lower 2010 rate was used as a baseline. For the higher-savings estimates (subset B), the 2011 rate was used as the baseline. 6 The 2% annual average increase is based on a simple average across the 120 procedures, meaning the average is not influenced by (or weighted for) for high-volume procedures, such as cataracts.